as they appeared on this website between 2004 and 2008. They are no longer being updated, and are retained for historical interest. They go backwards in chronological order from 2008 to 2004. 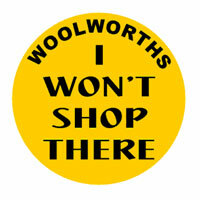 At the end you will see a Mullumbimby grocer wearing one of our 'I Won't Shop There' logos on his t-shirt! Ubiquitous Woolworths spokeswoman Clare Buchanan is now reported as saying that Woolworths Maleny is doing "very very well". This is a big change from her usual response that it is trading "as well as we expected". The quote is in a Sydney Morning Herald article on Saturday about Woolworths and Mullumbimby. One of our campaign team has written to the SMH pointing out that Woolworths Maleny is the only one of the company's 700-plus supermarkets that does not list monthly turnover in internal newsletters (and perhaps Ms Buchanan could explain why). Another new line from Ms Buchanan is the claim that Woolworths has received letters from residents of various other towns invaded by Woolworths supermarkets saying that their objections had been unfounded. Way too unbelievable! (Apart from curiously admitting a list of places Woolworths has gone where it was not welcome). The suggestion is that this indicates that the anti-Woolworths snowball which we helped start rolling in Maleny is worrying the company. So.... we must maintain our efforts to inform the masses, especially visitors, why they should 'shop local' and avoid that cursed supermarket and its many subsidiaries... and counter Ms Buchanan's propaganda at every opportunity. In mid June 2008 the final section of pre-existing bamboo vegetation was cleared from the bank of Obi Obi Creek. This resulted in the controversial supermarket being plainly visible to the town for the first time. Trees planted close to the creek side of the building have grown well over the past two years and we look forward to the time when the entire site has a creek-side canopy of trees once more. The Mt Evelyn Residents Against Woolworths action group are celebrating the stopping of another clone supermarket invading their town. They have sent us a heart-warming message. Congratulations from the people of Maleny! THIS week marks the fourth anniversary of one of Maleny’s darkest days, when the notorious Deen Brothers demolition firm ravaged the Obi Obi creekside next to the pub to prepare for a Woolworths supermarket. Soon after dawn on Wednesday April 14, 2004, several 19-tonne excavators and a bulldozer began smashing down all vegetation on 2-4 Bunya Street. A contingent of 70 Queensland police from the Tactical Crime Squad and a hastily erected site fence blocked protesters’ access. A steadily growing crowd of nearly 400 watched in horror as the Deen Brothers (Belle Vue Hotel, Cloudland Ballroom) flattened native trees, including Bunya and Karri pines, with swinging excavator buckets, bulldozer blade and chainsaws. Despite promises by Woolworths property manager Peter Thomas at a public meeting that no native trees would be affected, the site was mostly cleared before protesters managed to stop the clearing at 9.20am. Urgent calls to the Department of Natural Resources raised doubt whether the company had a permit to clear on riverine land, which carries a penalty of $125,000. About 30 protesters entered the site by wading the Obi Obi. They linked arms around a forked bunya pine, a silky oak and a persimmon tree as the excavators moved closer. Others climbed trees and were removed by police. Seven were arrested. Police dropped the charges, most for allegedly obstructing police and resisting arrest, after the protesters attended court in Maroochydore four times. The forked bunya pine, the last in Bunya Street, was saved by Daniel Jones, 28, a local landscape gardener, who climbed the tree and lived in it, with the help of locals, for 60 days. Maleny’s tree-sitter drew international support for Maleny’s plight. The State Government challenged the riverine tree-clearing in the Planning and Environment Court but developer Cornerstone found loopholes in the State Water Act 2000 and won the court case. The legislation has since been tightened, but the new Act is not retrospective. Trashing of the Obi Obi site on April 14, 2004, followed about three years’ community opposition to a supermarket on the known platypus habitat and important water catchment. The fight intensified over the next 15 months until possibly an even blacker day, July 14, 2005, when at least 200 Queensland police oversaw the start of supermarket construction work on the site. The rest is history. The picturesque and environmentally important entrance to Maleny is now blighted by an ugly concrete box-like structure - a far cry from the small, boutique-style supermarket “in keeping with Maleny’s village character” promised by Woolworths executives. The fight continues, with a large number of Maleny residents refusing to shop at Woolworths in Maleny, or anywhere else. Woolworths has more than 700 supermarkets in Australia and the turnover for all but one is recorded monthly in company documents. The glaring omission is Woolworths Maleny, suggesting that residents’ “I Won’t Shop There” campaign is having an effect. The ill-placed Woolworths supermarket building in Maleny proved beyond any doubt that it is located in an inappropriate site when recent heavy rain swelled Obi Obi Creek. For many years leading up to the construction it was pointed out that the blockage of a low sweeping bank of Obi Obi Creek by the huge building would act as a choke point for fast flowing waters trying to escape downstream. Obi Obi Creek backed up as a result of this building being where it is. The footpath under Maple Street bridge was flooded over, and Tesch Park just escaped being inundated. Higher volumes of floodwaters in 1999 did not cause such a problem as huge quantities of water could surge over the low bank where the supermarket building now stands.